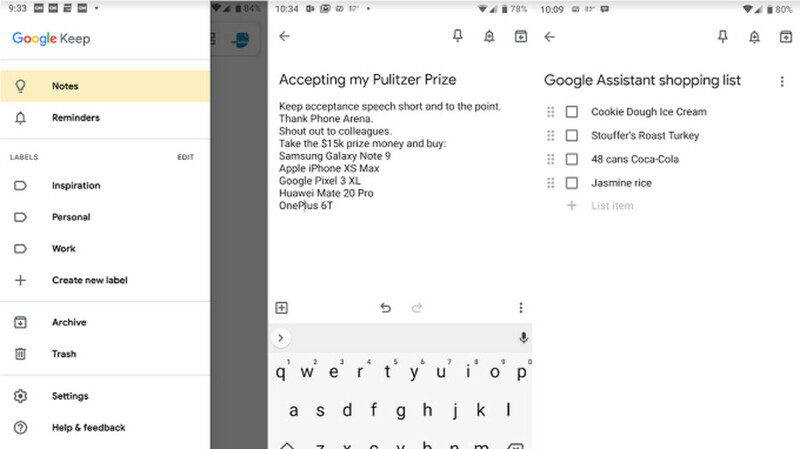 Productivity and note taking app Google Keep is now the latest app in the Google universe to be updated using the company's Material Design. That gives it a sleeker and brighter look with more white space, and Google Sans takes over as the new text font. We wouldn't be surprised to see a dark theme eventually offered, which seems to be the case with many of the apps Google has updated to its Material Design. This is because the white background used by Google for these updates has a tendency to melt users' retinas when the lights are low, or off. With Keep, you can take notes, create shopping lists, make to-do lists and more. You can check off each item or task when completed. If you're the type that typically awakens at 3am with a great song lyric or the next big invention, this is the app you need to take down your thoughts before they disappear from your mind. And if you don't feel like typing, simply tap on the microphone icon and dictate your thoughts to the app. Keep is a very useful app for the person who likes to get things done. And it is available to both Android and iOS users. To install Keep, simply click on the appropriate link: (Android|iOS). Google needs to fire their UI designers. First party apps should be professional and mature. Not childish and playful. The new UI font is horrible. At least put some grey in there to separate some elements! Dialer, messages, keep, maps, ect is all kinds of f**Ed up and feel cheap. Fitting I suppose...perfect to go along with those cheap Chinese cases that go on Android phones. Forgot to mention the nasty Easter colors on dialer and messages. 898 comments and you still haven't gotten one right. Keep trying. 898. Is that how many hair follicles left on your dome? You're going to have to do a LOT better than that, kid. Bald jokes don't bother me. The more hair I lose, the more head I get. Maybe one of these days, you'll grow up, move out of your Mom's house and actually have something productive to say. Seriously doubt it though. “898 comments and you still haven't gotten one right. Keep trying.” “actually have something productive to say” I’m noticing a pattern, and it’s not male baldness related. We won’t know if the majority, or minority does, but with iPhone, it’s not the only option.